An improving economy is contributing to a strong tourism season in Michigan. 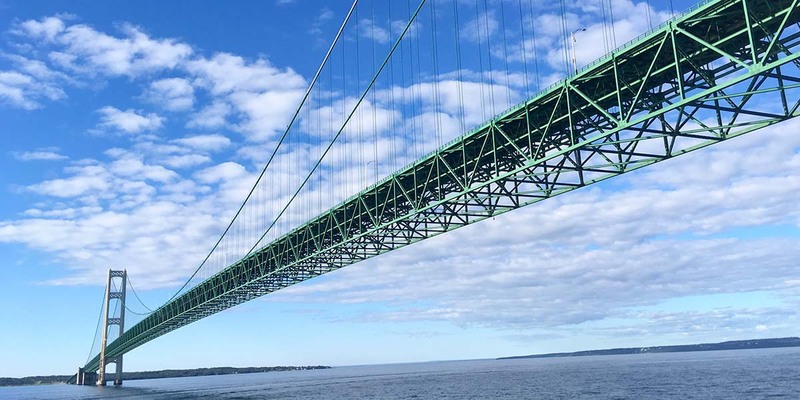 From state park campsite reservations to national park visits, from Mackinac Bridge crossings to hotel stays, tourists are driving a solid Michigan summer for the tourism industry, data show. People in the industry, including visitors’ bureau directors and hotel operators, are optimistic the pace will continue as visitors flock to see Michigan’s fall colors. Travel in Michigan, in general, has been rising steadily since the bottom of the recession in 2008 and 2009, leaders of local, regional and state agencies say. The economy now is in its eighth year of expansion. State tourism officials also point to evidence that the state’s Pure Michigan tourism campaign is leading to more brand awareness and more visits to the state. But the data they rely on are estimates based on calculations that the state won’t make publicly available. MORE COVERAGE: State says ‘Pure Michigan’ campaign brings more than $1 billion into Michigan. Skeptics say prove it. Anecdotally, industry members say they believe their investment in Pure Michigan advertising — a number of regional travel bureaus help pay for the commercials — is worth it when they see more people booking hotel rooms and visiting events. Detroit’s post-bankruptcy recovery has spurred new development and interest in the city, especially downtown, O’Callaghan said. He added that he has seen more foot traffic in the city center, especially on weekends. In addition, changing tourism trends look as though they will have a positive effect on the statewide travel industry, as millennials increasingly look to spend money on experiences, rather than possessions, said Dave Lorenz, vice president of Travel Michigan, the state’s tourism division. Gov. Rick Snyder has promoted Michigan as a tourism destination on his overseas trade trips, most notably in China; the state saw some softness in international visitors in 2016, Lorenz said, which he said could be attributed to a stronger U.S. dollar and uncertainty surrounding the presidential election. But Lorenz contends Michigan will benefit from travelers who spend more of their discretionary money on vacations, in part because Pure Michigan advertising has stayed active in regional and national markets as the economy improved. It’s difficult to quantify the Pure Michigan campaign’s impact on tourism activity. The state hires an outside company to research brand awareness through surveys and gauge return on investment. But those figures are estimates, and since travelers aren’t polled at the state line there’s no definitive way to determine what prompted someone to take a trip. Hotel occupancy in Grand Rapids was close to 69 percent through August, said Doug Small, president and CEO of Experience Grand Rapids. That’s up from a low of 48 percent in 2008, he said. Likewise, hotel average daily rates are running at about $117 through August, Small said, up $3 from the same time last year. In Traverse City, hotel visits were trending upward by about 3 percent from May through September year over year at three hotels owned by Alex Mowczan’s Summerside Properties LLC. July was slightly down, though the weather was cooler and wetter this year, he said. Hotel occupancy is 68.1 percent through August in metro Detroit, compared to 67.3 percent a year ago, said O’Callaghan, of the metro Detroit visitors’ bureau. Average daily rates are now at close to $103 through August, up from nearly $99 last year. Occupancy crashed to nearly 47 percent during the worst of the recession, he said. Meetings and convention business is growing in Grand Rapids, but leisure travel has seen “tremendous growth” in part due to the region’s craft beer scene and the city’s arts and culture, Small said. Total lodging reservations at state park campsites were up close to 14 percent in July from the same month in 2016 — 997,381 compared to 875,919, according to data from the Michigan Department of Natural Resources. “This is probably as good as it’s been, I would say, in 10 years,” said Ron Olson, the DNR’s chief of parks and recreation. 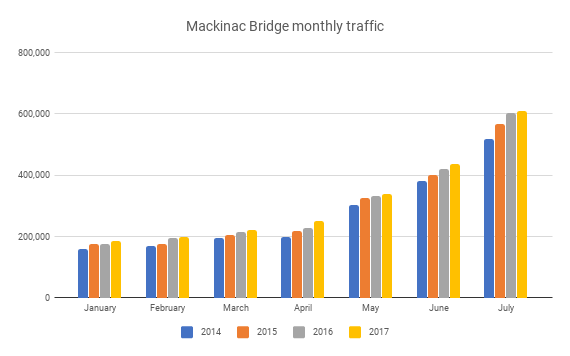 Mackinac Bridge crossings have increased every month of the year through July, at roughly 2.2 million for the first seven months of 2017, based on data from the Mackinac Bridge Authority. The increase in Mackinac Bridge crossings looks impressive if you only go back to 2014, the year crossings bottomed out at 3.64 million since the Great Recession because crude oil remained above $90 a barrel and Michigan unleaded above $3.30 a gallon until the autumn of 2014. If you look back further at bridge crossing data, which you can using Archive.org (as far back as September 1998), you can see bridge crossing increases in 2015, 2016 and so far during 2017 have risen 38 percent of the way back toward the peak year, 1999, when 4.95 million vehicles crossed. Crossings in 2017 are on course to finish the year around 4.2 million. Tourism is often the biggest asset for a Community. It not only provides new dollars from visitors, but it often provides a retirement homes.